Patients with Sjögren’s usually see their autoimmune treating physician several times a year. Mostly, they are rheumatologists, but can also be primary physicians, internists or subspecialists such as interested pulmonary or hematology doctors. In addition to taking a history, performing a physical examination, or drawing blood tests, are there things that should be specifically looked at or monitored for? This article reviews the top five items. 1. Is there evidence for extraglandular Sjögren’s? Some people with extraglandular Sjögren’s may have interstitial lung disease, renal tubular acidosis, swollen lymph glands, or inflammatory scarring of the bile ducts (biliary cirrhosis). Being identified with extraglandular Sjögren’s usually warrants systemic immune suppressive therapy with agents such as azathioprine, methotrexate, cyclophosphamide or rituximab. 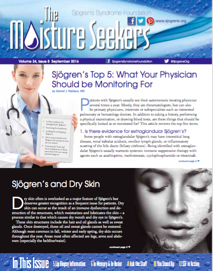 The treating physician should use their tools to screen for the spread of Sjögren’s to new areas with imaging or laboratory testing, which allows one to be proactive and treat the disease early. Over a 15-20 year period of observation, 8-15% of Sjögren’s patients develop a lymphoma. Screening for symptoms of early lymphoma include asking a patient about swollen glands, fevers, weight loss and new onset of fatigue. A physical examination can detect lymph nodes, evidence for a “wasted” appearance, or an enlarged spleen. I perform a serum protein electrophoresis (a $30 blood test) on my Sjögren’s patients every 6 months. Often, early lymphomas can be detected with the development of an extra protein on this determination, which is known as a “MGUS” or monoclonal gammopathy of uncertain significance. Most Sjögren’s associated lymphomas are of a specific variety known as “MALT” that, if identified early, responds well to treatment. Sjögren’s patients can have features of other autoimmune conditions such as rheumatoid arthritis, inflammatory myositis, biliary cirrhosis, scleroderma, Hashimoto’s thyroiditis or lupus, while still being “mostly” Sjögren’s. These features may warrant certain anti-inflammatory interventions. This would include corticosteroids for inflamed muscles, drugs that promote more oxygen to dilate the vessels of the hands for individuals with Raynaud’s (often seen with scleroderma or lupus), approaches that halt the development of erosions (bone destruction) with rheumatoid arthritis (e.g., anti-TNFs), ursodiol for biliary cirrhosis, antimalarials for subacute cutaneous lupus rashes in anti-SSA positive patients or thyroid. Identification of a secondary autoimmune overlap can often explain symptoms that may be profound but are not a part of Sjögren’s. Sjögren’s patients may have high blood pressure, depression and diabetes, as does 25% of the United States. Medications given for these conditions can make dry eye or dry mouth symptoms more severe. Treating such patients with anti-inflammatory medications or diuretics (water pills) is not advisable. Before altering one’s Sjögren’s medications or their environment, the physician should strive to rule out co-morbidities or co-existing circumstances that may seemingly worsen Sjögren’s symptoms. Patients with Sjögren’s whose disease is confined to the salivary glands, eye, head and neck areas occasionally develop complications, which may mandate emergent treatment. These include acute inflammation of the parotid gland (parotitis, or Mikulicz’s syndrome, with either a stone or focus of inflammation, treated with corticosteroids), corneal ulcerations, blocked salivary ducts (affecting the mouth), and dental caries or abscesses. Most Sjögren’s patients see a dentist 2-3 times a year to get their teeth cleaned, and are often frequent return visitors to their otolaryngologist (ENT doctor). In summary, screening for the five features reviewed above, can prevent or promote early treatment of the overwhelming complications with Sjögren’s.